Hand laced edge Oil Tanned Harness leather belt. 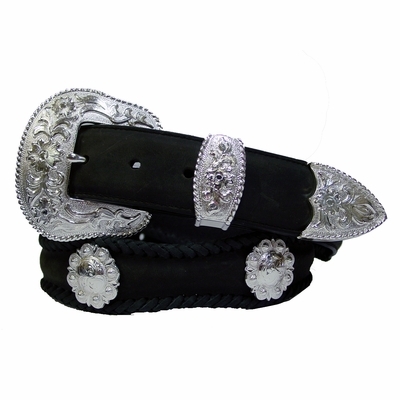 Shiny Silver Plated Three Piece Buckle Set and Berry Conchos made from hand engraved masters. 1 1/2" wide. Our belts are measured from where the leather ends at the buckle end to the middle hole at the tip end. Sizes Available from 30" thru 60".